One of our specialties at Betta Marquee is designing custom printed marquees and banners for businesses and organisations. An image marquee is the best way to stand out from the crowd at events. Our graphic design team will work with you to achieve the perfect design for your needs, and we offer unlimited free design assistance. 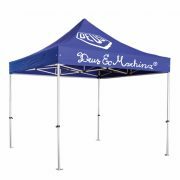 Think of the roof and sides of your pop up canopy as being free advertising space that you can fill with your logo, slogan, telephone number, and even colorful images. A marquee printed with your personalised message is an excellent way to get your gazebo noticed and draw more visitors. Betta Marquee offers three types of printing techniques to meet any requirements: screen printing for single color logos, dye sublimation printing for artwork with multiple colors, and digital printing for unlimited possibilities. 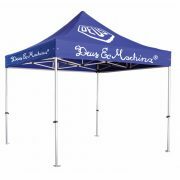 In addition to printing on the roof of your folding gazebo marquee, consider adding custom banners and free standing feather banners to attract even more attention to your display. Visit our image gallery to see examples of the custom printed marquees created by Betta Marquee.